My hometown of Portland, Oregon, is known for a lot of things – rain, coffee, beer, roses and being generally a little weird. But perhaps the thing we’re most famous for is our trees. We live under a beautiful urban canopy, nestled against a backdrop of densely forested hills and mountains. We’re passionate about our woods and protect them fiercely. Perhaps fierce is also a good way to describe how we feel about our local NBA team, the Portland Trail Blazers. Despite the relatively small size of our city, we’ve been called the best fans in the NBA (by ourselves – cheatsheet.com gave us No. 2). Part of my job for Daimler Trucks North America (DTNA) is managing our corporate sponsorship of the Blazers. When we first set the terms of this sponsorship, we wanted to make sure that it went beyond basic marketing. We needed an impactful presence alongside the Blazers that would raise awareness of our rather obscure corporate brand and help reconnect us with our neighbors. Almost everyone recognizes our product brands like Thomas Built school buses, Western Star trucks and Freightliner trucks, but many remain unaware that in 2008 our company name changed from Freightliner LLC to Daimler Trucks North America LLC. We also wanted Blazer fans to know us as a good corporate citizen who makes a difference in the community. Thus, Threes for Trees was born. This program partners us with the Blazers, as well as a local nonprofit called Friends of Trees, in a commitment to plant three trees for every 3-point shot the Blazers score. The program has been a huge success, claiming the distinction of the Blazer’s second most recognized community program. For the past four NBA seasons, the Blazers have scored more than 800 3-pointers each season, and all the corresponding trees were planted at the Sandy River Delta Park, a popular local recreation spot for Portlanders and their dogs. A former dam left the wetland area badly damaged. In the past decade, a huge effort has been made to restore and reforest this unique habitat. Our trees help curb invasive plant species, decrease erosion and bring native Oregon wildlife back to their ancestral home. They ensure our city stays healthy and beautiful. Every year, we host a special DTNA employee planting day with the help of the Blazers and Friends of Trees. Our employees show their Daimler pride as they get their hands dirty planting hundreds of indigenous young trees and shrubs. This year, on April 13, our planting day included an extra special celebration: We planted our 15,000th Threes for Trees tree at the park. I’m incredibly proud of this milestone as a DTNA employee, as a nature-lover and as a Blazers fan. Fifteen thousand mature trees mean that DTNA helps to remove 21+ tons of carbon dioxide from the air annually. In addition, these trees will continue to impact the lives of generations of Portlanders as they’ll create enough oxygen for about 30,000 people every year. And we’re not stopping at 15,000. 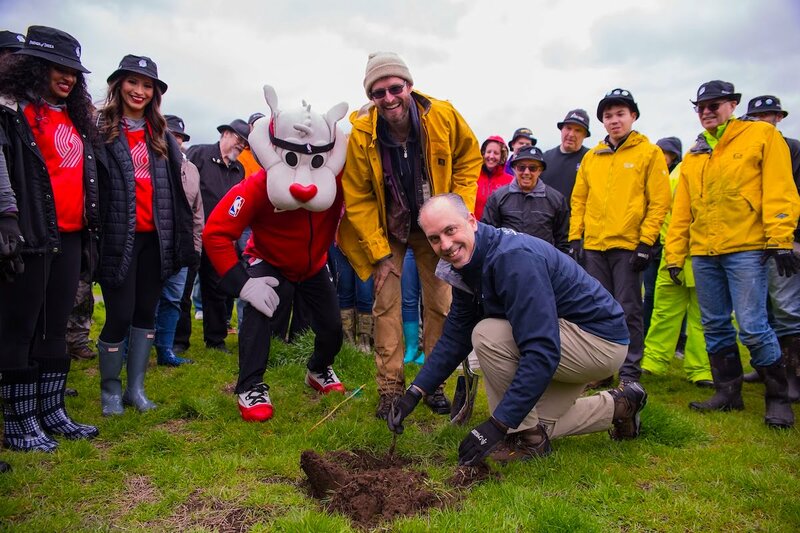 For the fourth season in a row, DTNA has committed to plant 30 trees for every 3-pointer the Blazers score during playoffs (a tradition started by our very own Martin Daum during his time in Portland!). So, if you love trees or if even if you just love basketball, support the Blazers this NBA playoff season!